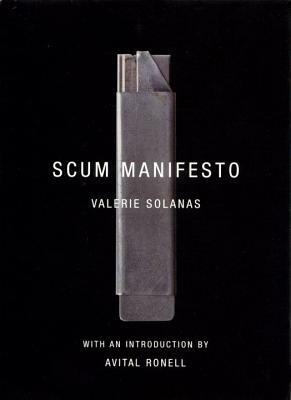 SCUM Manifesto was considered one of the most outrageous, violent and certifiably crazy tracts when it first appeared in 1968. Valerie Solanas, the woman who shot Andy Warhol, self-published this work just before her rampage against the king of Pop Art made her a household name and resulted in her confinement to a mental institution. But the Manifesto, for all its vitriol, is impossible to dismiss as just the rantings of a lesbian lunatic. In fact, the work has indisputable prescience, not only as a radical feminist analysis light-years ahead of its timepredicting artificial insemination, ATMs, a feminist uprising against under-representation in the artsbut also as a stunning testament to the rage of an abused and destitute woman. The focus of this edition is not on the nostalgic appeal of the work, but on Avital Ronell’s incisive introduction, “Deviant Payback: The Aims of Valerie Solanas.” Here is a reconsideration of Solanas’s infamous text in light of her social milieu, Derrida’s “The Ends of Man” (written in the same year), Judith Butler’s Excitable Speech, Nietzsche’s Ubermensch and notorious feminist icons from Medusa, Medea and Antigone, to Lizzie Borden, Lorenna Bobbit and Aileen Wournos, illuminating the evocative exuberance of Solanas’s dark tract. Avital Ronell teaches at New York University, The European Graduate School and Paris VIII, and is the author of many books including The Test Drive.